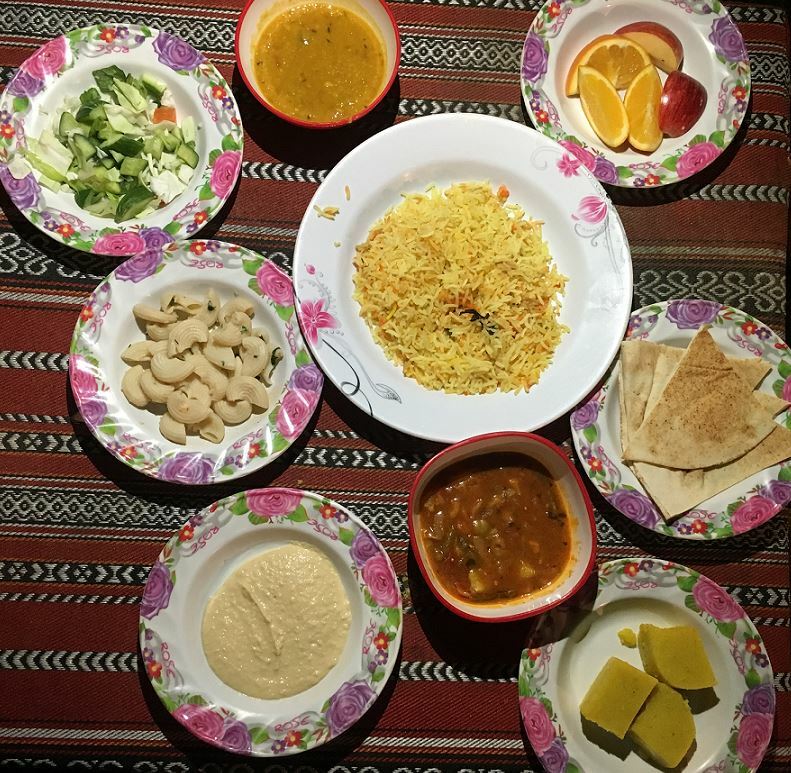 When we decided to start our Big Trip around the world in Dubai, there were a few things that had to be on our Dubai itinerary. 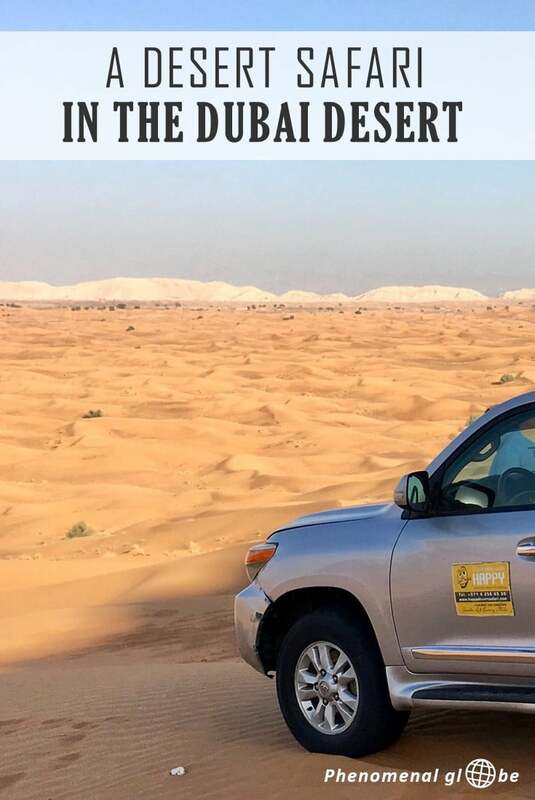 Besides the obvious highlights (Burj Khalifa, Dubai Mall, Palm Jumeirah and the Burj al Arab) I really wanted to make a desert safari because I had never been to the desert before. 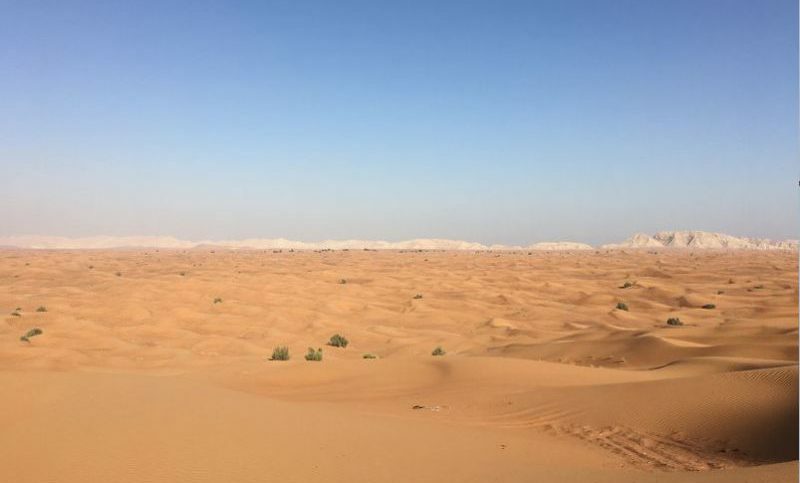 Wide deserted landscapes are kind of my thing, so besides exploring the glitter and glamour of Dubai I really wanted to get out of the city and into the desert. And so we did! 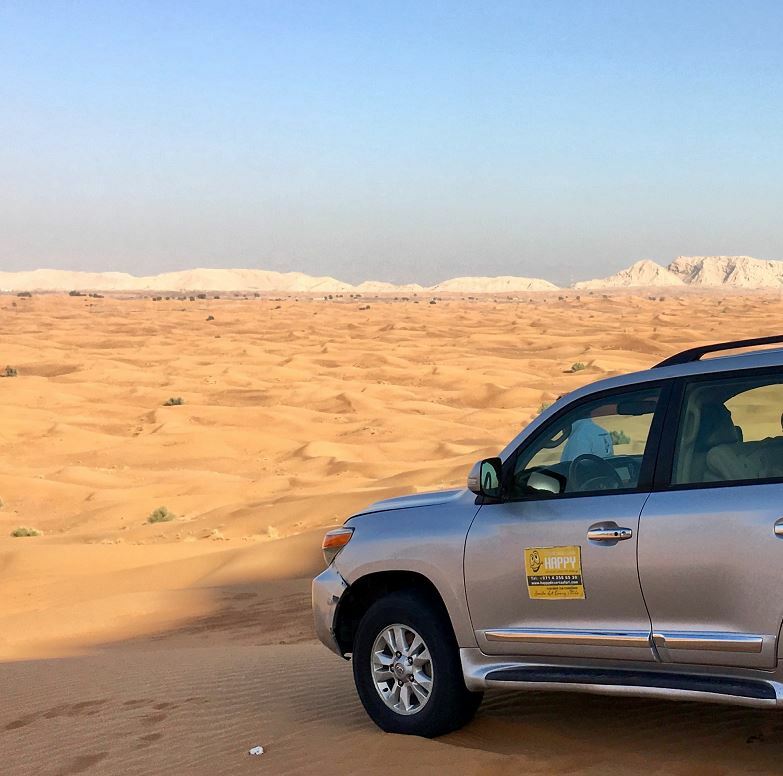 We went on a desert safari with Happy Adventures and it was awesome! First up on the desert safari itinerary was dune bashing. I didn’t know it until I did it, but I love dune bashing?. It was such a thrill to drive through the desert, drifting over the tall sand dunes and feeling your stomach lurch after a steep drop over the top of a dune. Anyway, after the adrenaline high of dune bashing we drove to the desert camp where it was time for the next activity: quad riding! You might not suspect it (sweet innocent girl that I am;-) but I can get very competitive in racing games. Once I went go-carting with my family and almost drove my sister of the track in a desperate attempt to finish first?. However, not wanting to wreck the quad on my first try, I kept my racing alter ego in check. 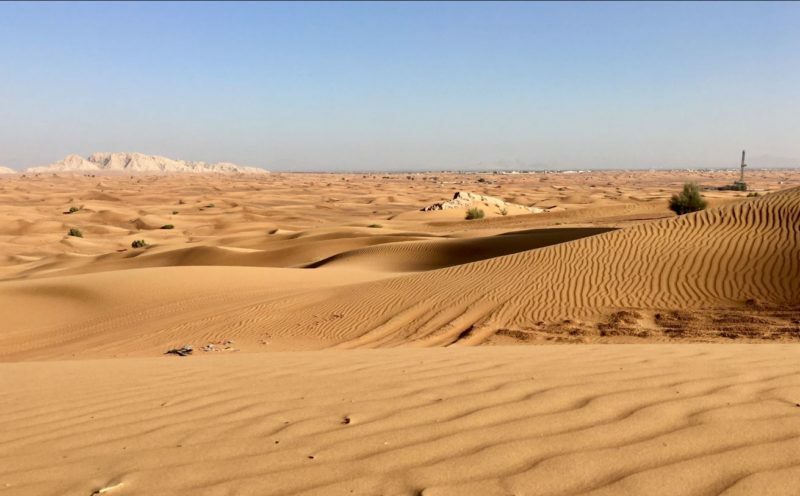 I completely understand quad riding through the desert is a favorite pastime for people living in Dubai! There was more riding to be done after the quad, from the mechanical race-monster we switched to a calmly swaying camel and got a bit of a feel of desert life. 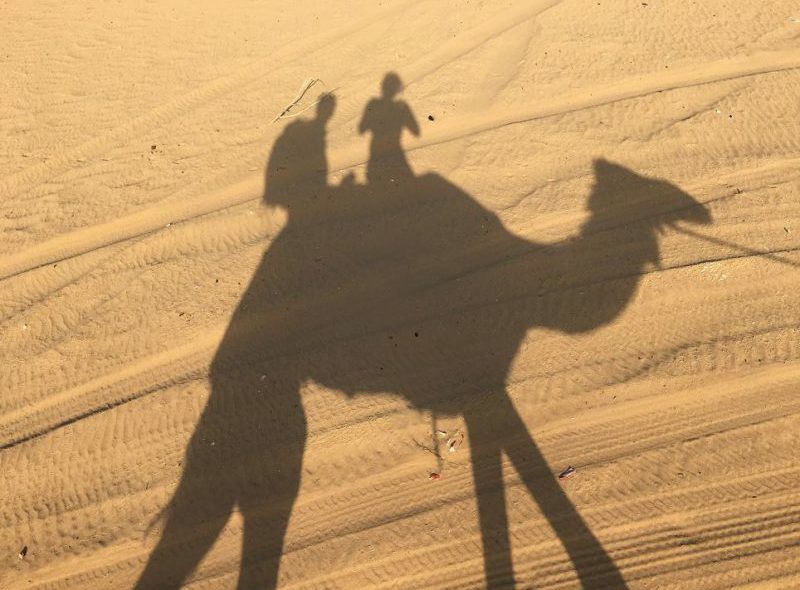 Having thanked the camel (well, mostly his handler) we explored the rst of the recreated desert camp. Bedouin or badawī in Arabic refers to people who live a nomadic lifestyles outside cities and towns. I don’t want a permanent tattoo but I’m really digging my henna one, it’s so pretty! The tattoo first turns orange but changes to a darkish brown after a while, it’s supposed to last for approximately 2 weeks. My guess is you’ll still see it for a while when the henna itself as gone but the rest of my (currently Holland-winter-white) hand got a bit of a tan?. Darkness fell swiftly after the sunset and the temperature noticeably dropped. Not that it was cold, but I was happy I brought a sweater (and a scarf as usual, my #1 travel item!). We walked back to the camp and sat down on a slightly elevated platform with a table and benches dressed with beautiful table cloths. From our seat we had an excellent view of the stage. 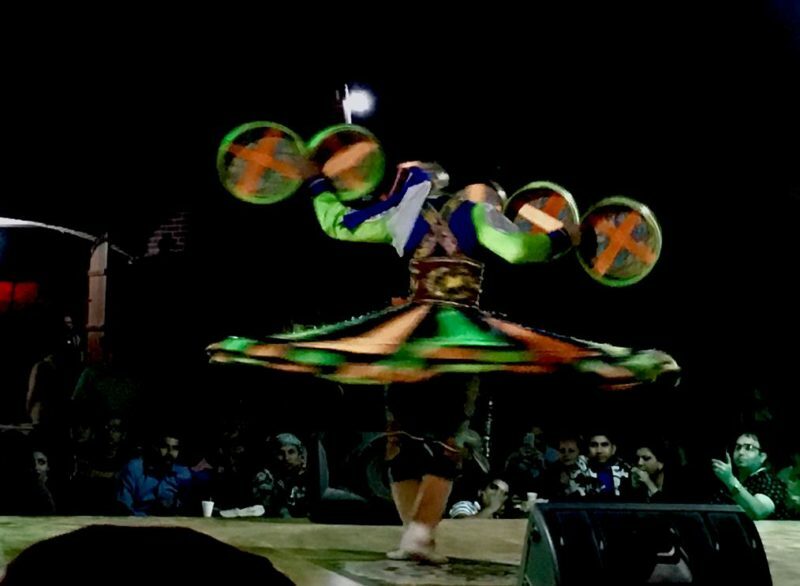 That was a good thing as there where several cultural performances: belly dancing, the traditional tanoura dance and a fire show! While watching these cultural performances, delicious food was being served. Dinner consisted of samosas, BBQ chicken, salad, hummus, fresh fruits and more tasty treats. Altogehter it was a wonderful day: it was my 1st time in the desert, the 1st time I went dune bashing, the 1st time I drove a quad and the 1st time I rode on camel. An awesome start of our Big Trip around the world☺! 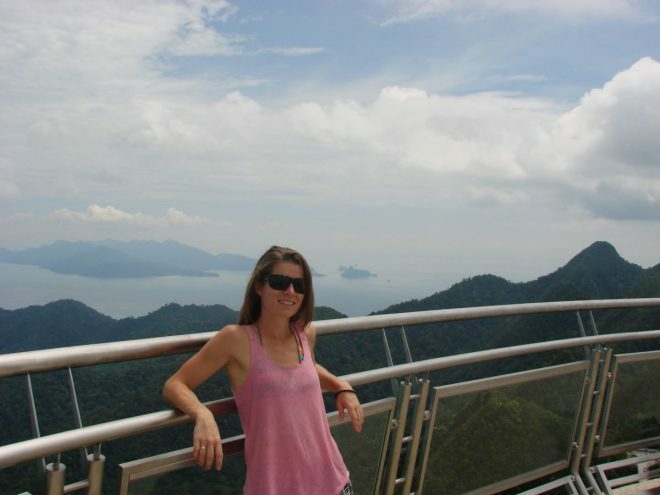 • We were picked up from our hotel at 1.30pm and returned around 9.30pm. • Take a warm layer with you as it gets a little colder during the evening. • Water, soft drinks, coffee and tea are available for free at the camp. If you’re hungry there are some snacks you can purchase. • Prices of the different desert safari packages can be found here. Disclaimer: I was a guest of Happy Adventures on their evening desert safari. Nevertheless, all pictures and opinions are my own. Nice. I once went on a hot balloon trip in Turkey, but in the desert also looks really nice ! You were a guest, so you were sponsored? In Cappadocia? I’ve seen a lot of pictures from hot air balloons in that place and they always look amazing! 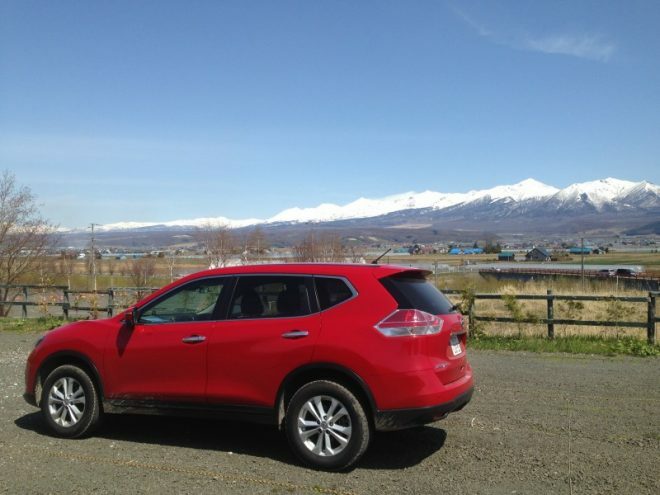 Yes, I was sponsored, hence the disclaimer?. Thank you for reading, we had an amazing time! Great pictures and nice read. It sure looks as if you had the time of your life. Dubai looks awesome! 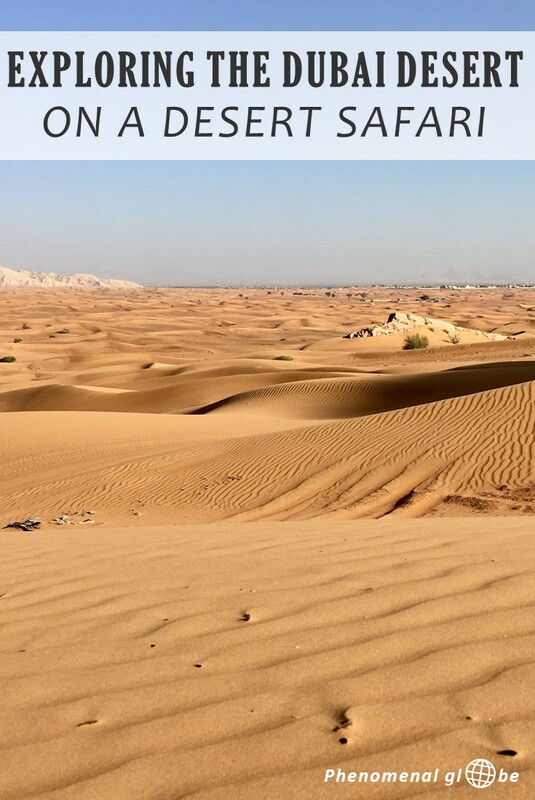 Thank you for sharing such a nice post about the desert safari, love to read and watch beautiful picture collections, thanks again!